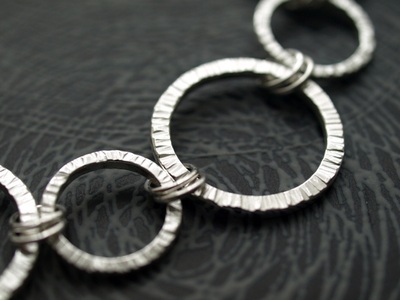 Made from Sterling Silver this collection is made up from individually handmade curved segments which are then linked together to form the bracelet and necklace. Earrings also available.. This delicate collection is available in a choice of colours, choose from Amethyst, Garnet or Turquoise semi-precious stones. Also available in children’s sizes. Made from Sterling Silver. This collection has been adapted for children and is available with Amethyst, Garnet, Turquoise or Peridot semi-precious stones. 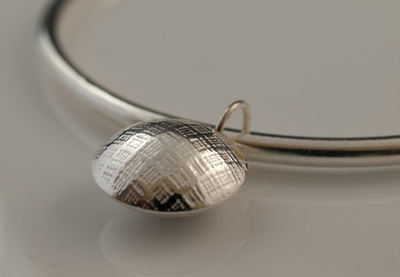 A contemporary collection made from Sterling Silver which has a textured pod as it’s main feature. The choker is designed so that the pod will rotate making it more slightly unusual. 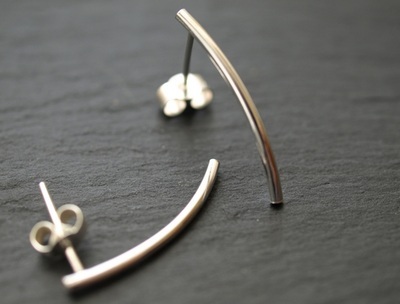 Made from Sterling Silver with an oxidised dome to create an element of colour. 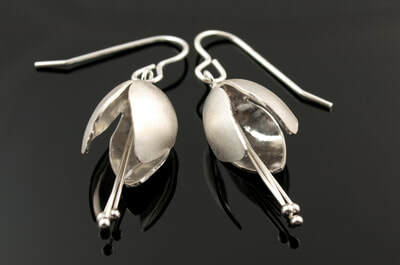 Made from Sterling Silver and inspired by the texture and form of an ivy leaf which I saw whilst on holiday in Croatia. 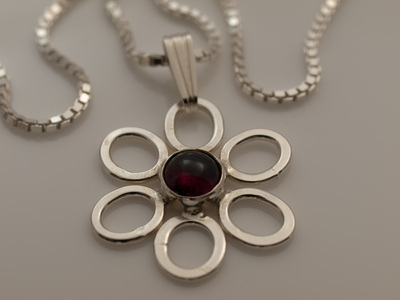 Made from Sterling Silver with an oxidised finish to create the colour. A more intricate range, but still keeping the oxidised dome as a colour feature. Made from Sterling Silver. Made from Sterling Silver this new collection captures elements from the form of a fuchsia. 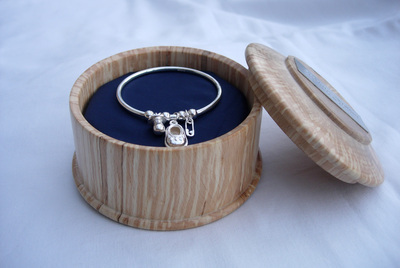 Made from Sterling Silver, this range features a textured element within the design. Available with “Stars” or “Stripes” pattern. Made from Sterling Silver. 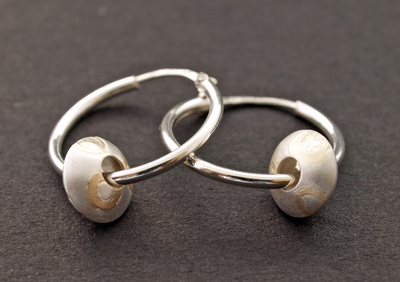 Each circle is individually handmade and textured which is then linked together with smaller rings creating the necklace, bracelet and drop earrings. 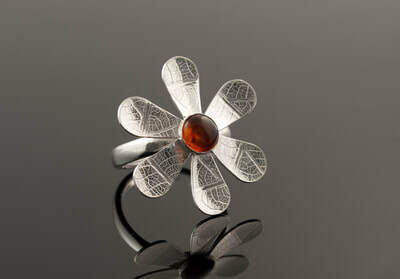 The flowers are created by individually making each petal from sterling silver sheet which I have textured using a skeleton leaf. Once all petals are cut out and formed I then solder them onto the bezel setting for the stone. Made from sterling silver. 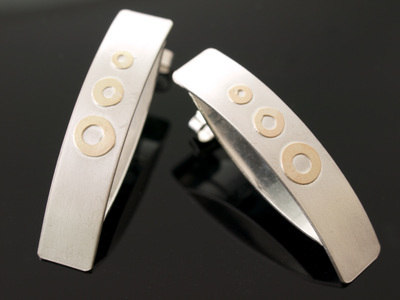 These cufflinks are made individually from textured silver sheet. Available with a star, cross hatch or diamond pattern. 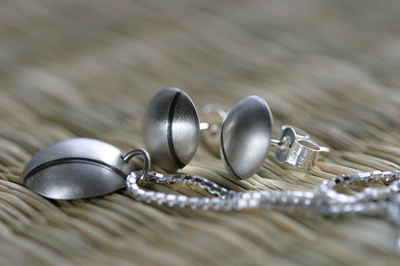 Each pod is made from sterling silver sheet which I have carefully cut and formed. I have then inlayed 9ct gold circles onto selected “pods” and finished with a satin finish to define the two metals. 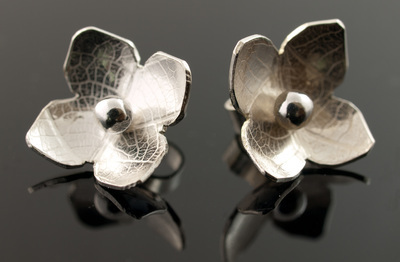 Using a skeleton leaf to create the texture onto silver sheet each flower is individually formed from sterling silver. 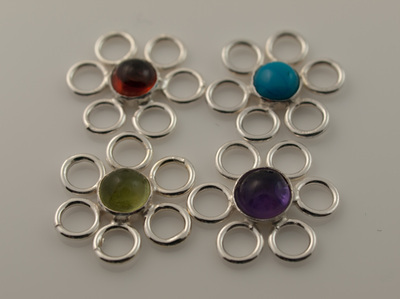 Studs are approx 10mm in size, drop earrings 15mm flower on a 45mm hookwire. This new collection features a pendant and studs. 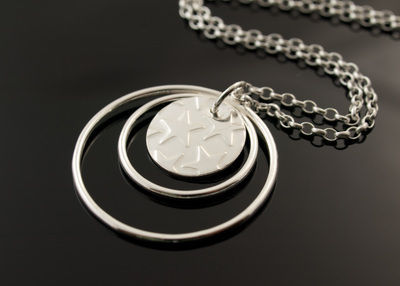 Made from sterling silver I have incorporated a selection of 9ct gold circles onto the front to create a contrast of colour. 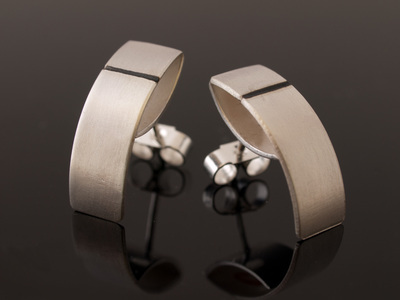 This contemporary collection is made from sterling silver. It has a satin finish to emphasise the oxidised line which has been inscribed into the silver. 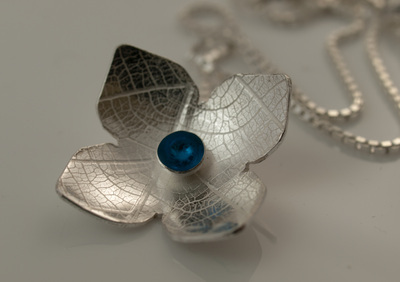 Using a skeleton leaf to create the texture onto silver sheet each flower is individually formed from sterling silver. This collection has enamelled centres.